Rekey Locks - High Desert Lock and Safe - 24 Hour Locksmith in Prescott, Arizona. At High Desert Lock and Safe we get calls everyday from customers asking if we can "change the locks" on their home. From commercial companies to local residents, people may find themselves in need of eliminating excess keys in circulation to their home or business. But... what exactly does this mean? Do I have to replace all the locks on my home? Fortunately, no, you do not. Rekeying locks simply means we remove the existing locks from your doors, recombinate the tumblers inside the lock cylinder and fit it back onto the door. Your hardware looks exactly as it did before and the expense compared to replacing the hardware is drastically reduced. The end result is you are able rest assured knowing that any existing keys, whether in your possession or not, no longer work. Should I Rekey My Locks? You may find yourself asking this question due to various factors. Perhaps you just bought a newly built home. Does the contractor or any of their subcontractors still have a key? What about my realtor? The home inspector? If it is an existing home, one may find themselves wondering who the previous home owners gave keys to. How many family members got copies? Do the neighbors have any? What about their old house cleaner? How can I be sure? Well, the only way to be sure is to start out fresh. Having the locks rekeyed on your new home is the only way to ensure that you are the only person with keys to your home. You'd be right in wondering how much it costs; after all, it sounds a bit complex. Fortunately we have good news! 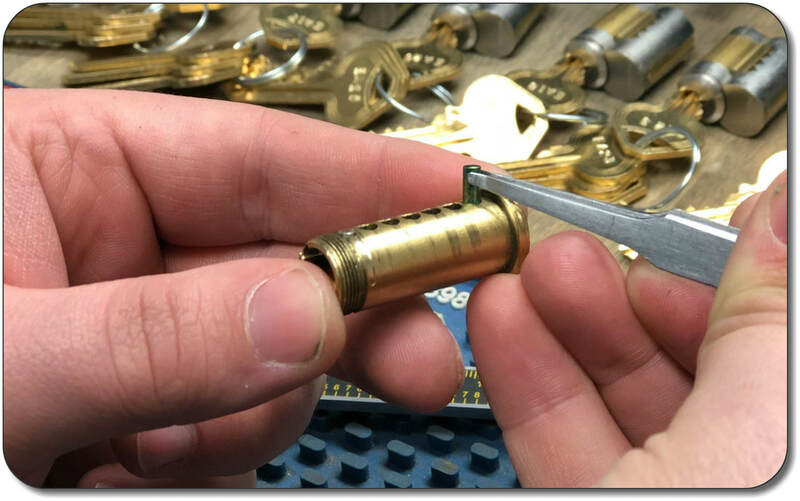 Rekeying your existing locks to a new key is a fairly simple task and surprisingly affordable. In fact, many homes come in at under $100 and take less than an hour to complete. Our competitive pricing is mainly based on how many locks you have in your home, and as no two homes are alike, pricing can vary. However, feel free to give us a call at (928) 445-0197 to get a free estimate over the phone on exactly how much it'll cost to rekey the locks on your home. Once you're ready, we will work around your schedule to send a highly trained and certified locksmith out to your home to get the job done right the first time. No more sticky keys or hard to lock doors. Our technicians test all the locks and keys before leaving your home to ensure the job is done right the first time. High Desert Lock and Safe - 24 Hour Locksmith Service in Prescott, Prescott Valley, Chino Valley and the surrounding area.